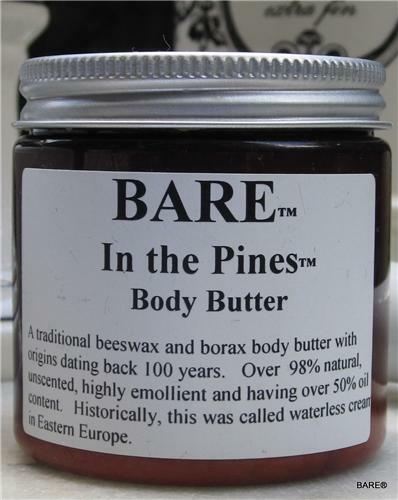 BARE "BARE IN THE PINES" Body Butter - The health benefits of pine oil include some emotional benefits. It gives an energizing, invigorating feeling. Pine plant oil is also useful for people suffering from loss of concentration and loss of memory. Regular massage with pine essential oil lends mental clarity. A traditional beeswax and borax body butter with origins dating BACK 100 Years. Over 98% natural, highly emollient and having over 50% oil content. Historically, this was called night cream or waterless cream in Eastern Europe. Thick, long lasting and capable of moisturizing the driest skin; typically being feet, elbows and knees. Associated more like a pomade or ointment than a usual cream. Helliantus Annuus (Sunflower) Seed Oil, Soja Hispida (Soya Bean) Oil, Simmondsia Chinesis (Jojoba) Seed Oil, De-Ionized Water, Natural Beeswax, Emulsifying Wax NF, Sodium Borate, Aloe Barbadensis (Aloe Vera) Leaf Juice, Fragrance, Chamomilla Recutita (Matricaria) Flower Extract (Chamomile), Disodium EDTA. Phenoxyethanol and Caprylyl Glycol.